If you’ve followed the site for awhile or keep up with the Dice Hate Me Twitter feed, you know by now that my coworkers and I play a lot of Bang! More than any other game that’s been introduced at lunchtime, Bang! seems to bring about the most mischievous glee as we ignore common courtesy and mercilessly gun each other down. Bang! also elevates our creativity, as we are continuously concocting and introducing various house rules to make things more interesting or to fix what we consider inconsistencies in theme. Back in July, I wrote a brief article on some of the basic house rules that we use in the office. With the exception of using dead horses for cover – many felt it was either too morbid or too obtuse – we continue to play with those rules. In the past three months we’ve since folded in the Dodge City, High Noon and Wild West Show expansions, which introduced some new cards and new rules. Naturally, this gave us the opportunity to make the west even wilder. Panic! is one of the most useful cards in the game – whenever you’re being hounded by some scallywag, you can use it to (hopefully) steal a Bang! or offensive card, or make off with their long-range weapon so they can’t shoot at you for a couple of rounds. Often, it can be used to wipe the smug look off the face of that coward who keeps hiding behind a Barrel. Just play Panic! to steal their prize possession and Bang! them to your heart’s content. Panic! does have a serious drawback, however – it only has a range of 1. That means that once the opponents on your right or left get on a Mustang or start hanging out in their new Hideout, you’ve got a worthless card in your hand. This didn’t sit right with us, so we changed things – we extended the range of Panic! to be equal to the range of a player’s current weapon. After all, the guy on the card is being held at gunpoint, so it only made sense that you could brandish your Winchester and force a gunslinger across town to drop a possession or two in their haste to take cover. 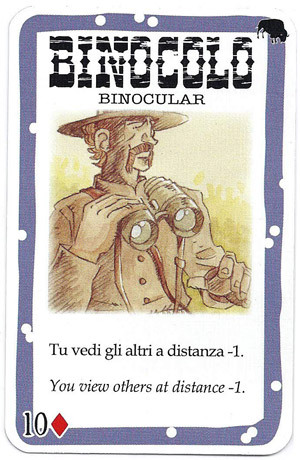 The first time we played with the Dodge City expansion, someone drew the Binocular card and threw it down. A lot of oohs and ahhs ensued, until we all read the description. It turns out that Binocular is just another Scope, and that’s just not right. Binoculars are for spying, not for shooting. Our rule soon became that the Binocular card could be played like a regular card, once, and used to take a look at another player’s hand. This can be a pretty powerful and handy ability, as it allows a player to see if another player has any Missed! or Dodge! cards before loading up their Volcanics for a shootout. Since there’s only one Binocular card in the deck, this doesn’t unbalance the play in the least, and makes for some fun (and often delightfully evil) situations. Dodge City has a lot of new cards, but none quite so annoying as the Hideout. The Hideout is the equivalent of a Mustang, increasing a player’s distance from other players. The insidious quality of Hideout is that it doesn’t count as a Mustang, so some lucky punk usually ends up riding his Mustang into his Hideout (crowded in there) and is now a minimum distance of three away from any player. This gets old really fast. The solution? Dynamite. 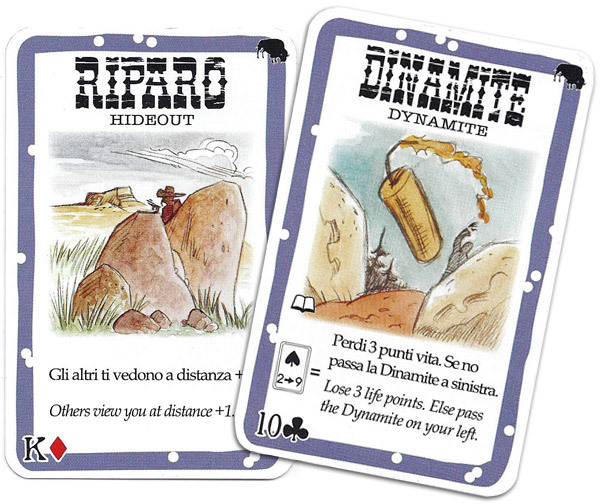 If a player is holding the Dynamite card in their hand, they can play it as a regular card and blow another player’s Hideout to Boot Hill. This also has the added bonus of ridding the table of the Renegade’s explosive best friend. With 16 initial characters in the base game, 15 in Dodge City, and 8 more ruffians in the Wild West Show expansion, Bang! players are spoiled for choice; so much so, in fact, that the gang I play with wanted to try out as many characters as they could as quickly as possible. In order to do so, we played around with the draw deck just a bit. 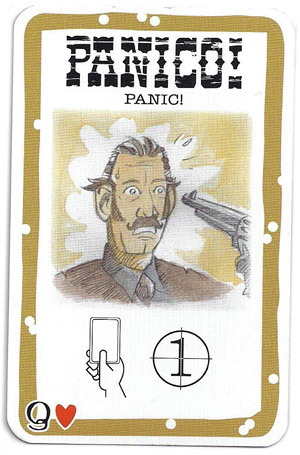 At the start of the game, after characters have been given out to all the players, three character cards are randomly placed into the play deck and shuffled with the remaining cards. If a player draws one of these characters during the game, that player can hold the character in hand and, on their turn, switch out their current character for that held character. If the character that they are switching to has fewer bullets than the player’s current stock, that player must discard down to the maximum bullet level. If a player switches to a character with a greater bullet count than their previous character, they can now increase their bullet count with Beer, Whiskey, etc. to the new maximum level. Character cards have a different back than regular Bang! cards, but this adds an interesting twist to gameplay. 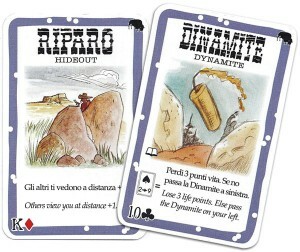 For instance, when a character card is sitting on top of the draw pile, every player knows that there is no suit on the card – in other words, Barrels, Dynamite and other cards that require a player to “draw” in order for an effect to take place will not have that effect activated on the next draw. The depth of strategy provided by random character cards in the deck, plus the added surprise of someone switching out from a lame character to a real gunslinger in the middle of the game has made this little variant a mainstay. Has your group of outlaws created some of their own house rules for Bang!? Let me know in the comments! Bang! is a wild west card game for 4 to 7 gunslingers, ages 8 and up, and retails for about $17 at your favorite local game store. Bang! 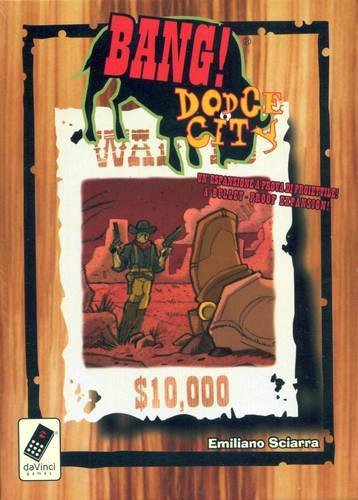 Dodge City is an expansion with new game cards and characters, and allows 3 to 8 gunslingers to shoot it out. It retails for about $14. Wild West Show is a brand-spanking new expansion that contains 8 new character cards and a special deck of cards that introduces new rules during game play and causes general chaos. It’s pretty awesome, and retails for about $8. You should buy ‘em all. *If you liked this article, you may want to sign up for the Dice Hate Me newsletter. I’ll let you know when other cool stuff like this is posted on the site. Also, as a bonus, whenever there’s a special giveaway or promotion on the site, if you’re on the mailing list you are automatically entered! Pretty sweet, right? Are binoculars part of Dodge City? Bang! is one of my favorites and I have the base and Dodge City. But I don’t think we have Binoculars or Scope in our set. Also, the text and symbols on my cards look slightly different than what you have pictured. Do you have an older or newer print set? You know, this is interesting… I started looking into it, and I can’t find confirmation of Binoculars on BGG, or anywhere else. I know that it came with my copy of Dodge City; I have one of the newest printings, which includes the HIgh Noon expansion, as well. My copy of the original Bang! is only a couple of years old – it’s the daVinci games version. I know that several versions from different publishers has come out over the years. I would be interested to know which versions of the game you have. I do know that they changed some of the symbols on the cards in later printings, so it’s probably safe to assume that you have an older print than mine. Even with an older print you should have Scopes in your original Bang! I don’t think that has changed across printings. Scope/Appaloosa are part of the vanilla BANG! Binoculars/Silver come in Dodge City. Both appear in the special edition Bullet.